Dairy housing systems have a substantial impact on the overall health and longevity of dairy cattle. 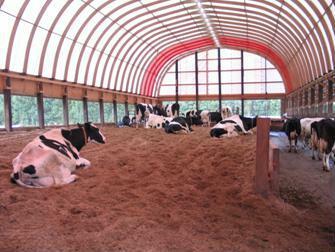 A compost bedded pack barn (generally known as a compost dairy barn) is an alternative loose housing system for dairy cows that appears to offer very good cow comfort for lactating, dry, and special needs cows. The first compost dairy barn in Minnesota was built in late 2001 by Portner Brothers from Sleepy Eye. Many more have been built in the state since that time. Compost dairy barns require excellent pack and ventilation management for the barns to perform well. Producers need to use appropriate bedding in adequate amounts. The bedded pack needs to be aerated twice daily to refresh the surface and enhance microbial activity in the pack. Compost barns will not perform well if the cows are overcrowded. Producers must use excellent cow prep procedures at milking time. Producers can have problems with compost barns if these guidelines are not followed. Compost barns are not the answer for every dairy producer. It is important to always match the manager with the system in order to be successful. Results of a cross-sectional field study on compost barns were recently published (Barberg et al., 2007a, Barberg et al., 2007b and Endres and Barberg, 2007). Additional field observations have also been reported (Janni et al., 2007). Figure 1. Good cow comfort in a hoop-style compost dairy barn. In general, compost barns have an indoor or an outdoor concrete feed alley, a bedded pack (resting) area, and a 4-foot-high wall surrounding the pack. The wall separating the pack and the feed alley has one to four walkways for cows and equipment to access the pack. This wall is 4 feet tall and typically of poured concrete construction. The bedding material is aerated twice daily using a cultivator or chisel plow type of equipment to dry the surface and incorporate manure into the pack. One of the reasons producers have adopted this alternative housing system is for improved cow comfort and longevity. A compost barn allows cows more freedom of movement than conventional tie stalls or free stalls. These barns may also provide a reduction in manure storage costs and needed space, and a savings in labor and manure handling. Figure 2 shows a typical drive-by compost barn layout. 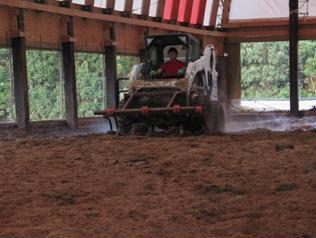 Compost barns can be laid out for drive-by feeding, covered feeding, or drive-through feeding with pens on both sides. They can also be used with feed bunks under roof or outside. Figure 2. 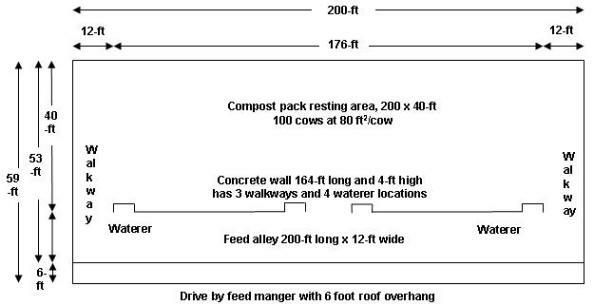 Compost barn layout for 100 cows with three walkways to the bedded pack, drive-by feeding, and 6-foot overhang. Waterers are against the concrete wall, separating the bedded pack from the feed alley and are accessed from the feed alley only. Not drawn to scale. Figure 3. Another example of a hoop-style compost barn. Figure 4. An example of a compost barn with center drive-through feeding. Compost barns are similar in many respects to typical free-stall dairy barns. Both have feed mangers, feed alleys, and waterers. The key difference is that the free stalls and free-stall alleys in free-stall barns are replaced with a bedded pack area in compost dairy barns that is aerated at least twice daily. A 4-foot-high (1.2 m) wall surrounds the pack on three sides and separates the pack and feed alley. The exterior walls can be cast-in-place concrete walls on footings below normal frost depths or wood. Some producers have the posts supporting the roof embedded in the exterior walls, while others have the posts mounted on top of the wall. In either case it is important that a structural engineer or the builder understand all of the structural loads that need to be considered (e.g., manure load, lateral earth pressure, machine load, roof load, wind load, wind lift load, snow load, etc.). The 4-foot wall separating the bedded pack and the feed alley usually has a fence on top to prevent cows from walking over the wall. The wall separating the pack area and the feed alley is cast-in-place concrete or movable concrete panels with a wide base, called Jersey walls. Walkways, at least 10- to 12-feet wide, are recommended at each end of the wall separating the bedded pack and the feed alley (as a minimum) for cow and equipment access to the pack area. Long barns will require additional walkways. Waterers are located along the feed alley. Waterers can be located on either side of the feed manger or adjacent to the concrete wall separating the bedded pack and the feed alley. Waterers are not located in the bedded pack area to minimize wetting of the pack, to keep the waterers cleaner, and to avoid having to adjust waterer height as pack depth increases. Compost barns are recommended to have 3-foot eave overhangs to minimize the chance of roof runoff and rain being blown into the barn and onto the bedded pack. Roof gutters will help reduce roof runoff from being blown onto the pack. The ground surrounding a compost barn should be sloped to minimize rain and snow runoff from entering the barn and wetting the bedded pack. Figure 5. 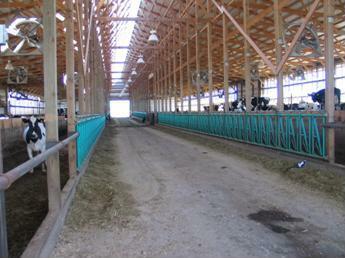 Example of a compost dairy barn with covered drive-by feeding. Initially 1 to 1 1/2 feet of loose, dry, fine wood shavings or sawdust is put down to start a compost barn pen. Fresh bedding is added when the bedded pack becomes moist enough for it to stick to the cows after they rise from lying down on the bedded pack. We recommend that the bedded area provide at least 80 to 85 feet2 of resting space per cow for an average mature Holstein or similar-sized breed and 65 feet2 for an average Jersey. The bedding material is aerated to a depth of 8 to 10 inches twice daily while cows are being milked, most often using a modified cultivator on a skid loader or small tractor. It is proposed that aeration is essential to incorporate oxygen for aerobic decomposition and to provide a fresh surface without accumulated manure for cows to lie down on after returning from the milking parlor or after feeding. Some producers in Minnesota are aerating the pack deeper (about 16 to 18 inches) using a chisel plow type of equipment and have observed a reduction in bedding needs and increased pack temperatures. Typically, a semitruck-load of fresh dry sawdust (approximately 18 tons) is added every two to five weeks, varying by season, weather conditions, and cow density. Some dairies prefer to add a smaller amount of sawdust more frequently, such as once weekly. There are a small number of other dairies adding a thin layer of bedding every day. Typically, no bedding material is removed from the pack area during the year, except in fall and spring. The bedded pack area is cleaned out entirely once a year in September or October. A load of clean sawdust is usually added after removal of the soiled bedding to provide a bedding layer 1 to 1 1/2 feet high to start the new pack. Some producers leave about half a foot of old material in the barn to help initiate microbial activity. By the end of summer, most packs average 4 feet high. Several farms remove a portion of the pack material in the spring to provide space for bedding accumulation during the summer. The soiled bedding is spread on the fields according to the farm manure management plan. Some producers pile the spent bedded material to produce finished compost. Figure 6. Many producers use a skid-steer loader to aerate the bedding. Adequate ventilation (air exchange) is needed to remove cow heat and moisture, as well as the heat and moisture that the biologically active pack generates. Sufficient air exchange is needed in cold weather to remove moisture from the pack and extend the time between bedding additions. Moisture, in large amounts, is commonly seen as steam rising from the pack during aerating in cold weather. This moisture needs to leave the barn with the ventilation air. Compost barns are recommended to have 16-foot sidewalls to provide better ventilation and access for bedding trucks. The sidewall height for a compost barn is recommended to be higher than that for a free-stall barn to accommodate the sidewall opening lost due to the bedded pack walls. Many compost barns have mixing fans to blow air downward onto the bedded pack to help dry the pack surface. The fans must be hung high enough to provide head room for aerating equipment at the maximum pack height. For our cross-sectional study, we took samples of the bedding material at two depths. These bedding samples were analyzed for moisture, ammonia, pH, total carbon (C), nitrogen (N), phosphorus (P), potassium (K), and electrical conductance (soluble salts) concentrations. Results are summarized on Table 1, including a column with recommended values for composting. The average carbon to nitrogen (C:N) ratio was 19.5:1. A C:N ratio below 25:1 may emit ammonia odor, which may influence the ammonia levels in compost barns. The average bedding temperature measured at various depths was 108 F and the pack surface temperatures were similar to the ambient temperature. Temperatures were greater in the areas of the pack that were fluffier and that were not as heavily soiled or packed by the cows. This observation is consistent with the need for oxygen and air for microbial activity that promotes composting. Barn building costs ranged from $33,000 to $300,000, with a cost per cow ranging from $625 to $1,750 (barn only, does not include milking parlor). The building costs ranged widely depending on the amount of on-farm labor utilized and amenities added. Bedding material costs ranged from 35 to 85 cents per cow per day, depending on the source of sawdust and from how far it had to be transported to reach the dairy. Bedding costs and availability of bedding materials was by far the major concern expressed by the producers. Alternative bedding options are currently being tested. Preliminary results indicate that sawdust is the best option for these types of barn, but combinations of sawdust with other materials, such as finely ground soybean or flax straw, finely processed corn cobs, or wood chip fines can work relatively well. The average herd size for the herds enrolled in our cross-sectional study was 73 cows. The Dairy Herd Improvement Association (DHIA) rolling herd average was 23,005 lb (range of 18,306 to 27,304) and Somatic Cell Count (SCC) was 325,000 cells/mL (range of 88,000 to 658,000) for the test date nearest to our visit. Statistical analysis of historical DHIA data indicated that 89% of the dairies had a significant increase in 305 mature-equivalent milk production when moving their cows from the previous housing system to the compost barn. The average increase was 2,105 lb/cow per year (range 870 to 2,934 lb). It is important to keep in mind that other changes were made to the dairy operation when moving cows to the compost barn, which most likely also contributed to the significant increase in milk production. Additionally, 57% of the dairies had an increase in heat detection rates (36.9% before and 41.5% after change in housing) and 71% of the dairies had an increase in pregnancy rates (13.2% before and 16.5% after change in housing). Herd turnover rates averaged 25.4% before and 20.9% after change in housing. We found that 67% of the dairies had a reduction in mastitis infection rates (defined as percent of cows with a SCC>200,000 in each DHIA test date). However, only 43% of the dairies had a significant reduction in bulk tank SCC, with one dairy having a significant increase. In general, a low level of contagious pathogens was detected in the milk bulk tank samples. One out of 12 farms had a high level of Streptococcus agalactiae, one farm had a high level of Staphylococcus aureus, whereas six farms had high levels of non-ag Strep, and five farms had high levels of coliforms (e.g., E.coli, Klebsiella, and Enterobacter) in the milk. It is interesting to note that udder health and milk quality were not necessarily compromised when housing cows in this bedded pack system, especially when total bacteria counts in the bedding material were 9,122,700 cfu/mL (range of 2,035,562 to 22,562,604). It has been suggested that bedding should have less than 1 million cfu/mL to reduce the risk for mastitis. Therefore, excellent cow prep procedures at milking time and healthy teat ends are essential in a compost dairy barn system. The feet and leg health of cows was good in the compost barns we visited. Overall, 7.8% of cows were clinically lame (locomotion score ≥ 3), with two herds having no lame cows. The average prevalence of lameness in compost dairy barns was much lower than the 24.6% (Espejo et al., 2006) and 27.8% (Cook et al., 2003) prevalence recently reported in free-stall barns and the 19.6% observed in tie-stall herds (Cook et al., 2003). Overall, 25.1% of cows exhibited a hock lesion, with 24.1% having hair loss and 1.0% having a swollen hock. Seven of the 12 herds had no severe lesions. Hock lesions that occurred in the previous free-stall or tie-stall barn were most likely still present or healing in the compost barn. Weary and Taszkun (2000) reported that 73% (n = 1,752 cows) of cows housed in free stalls had at least one hock lesion, nearly three times the prevalence we observed in compost barns. Furthermore, Endres et al. (2005) observed in free-stall herds (n = 5,328 cows) that 14.1% of cows housed on mattress-based free stalls and 1.8% of cows on sand-based free stalls had swollen hocks. Results on the prevalence of lameness and hock lesions in our study suggest that cow welfare, especially in relation to feet and legs, could potentially be better in these barns than in stall systems. We had some concerns about dust, which could predispose cows to pneumonia or cause eye irritation, and air quality, such as ammonia and/or hydrogen sulfide levels. More research is needed in these areas. Provide at least 80 to 85 feet2 per cow for Holsteins and similar-sized breeds and 65 feet2 for Jerseys. Some producers provide 100 feet2 per cow. Use fine, dry wood shavings or sawdust for bedding. Alternative bedding materials are being investigated. Aerate the pack twice daily 10 inches deep or deeper to keep it aerobic and fluffy. Biological activity helps dry the pack. Enhance biological activity to generate heat to drive off moisture, and ventilate the barn well to remove the moisture. Use excellent cow prep at milking time. 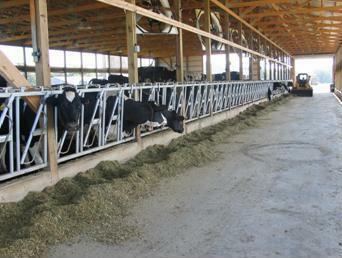 Based on current observations, a compost dairy barn can be an adequate housing system for lactating dairy cows, especially for small- to medium-sized dairies or as a special needs barn in larger free-stall dairies. As with any system, optimum management is absolutely necessary to achieve desirable results. There are many housing options for dairy cattle, and producers should choose the option that will work best for them. Barberg, A.E., M.I. Endres, J.A. Salfer, and J. K. Reneau. 2007a. Performance, health and well-being of dairy cows in an alternative housing system in Minnesota. J. Dairy Sci. 90:1575-1583. Barberg, A.E., M.I. Endres, and K.A. Janni. 2007b. Dairy compost barns in Minnesota: a descriptive study. Appl. Eng. Agric. 23:231-238. Cook, N. B. 2003. Prevalence of lameness among dairy cattle in Wisconsin as a function of housing type and stall surface. J. Am. Vet. Med. Assoc. 223:1324-1328. Endres, M.I. and A.E. Barberg. 2007. Behavior of dairy cows in an alternative bedded-pack housing system. J. Dairy Sci. (in press). Espejo, L.A., M.I. Endres, and J. A. Salfer. 2006. Prevalence of lameness in high-producing Holstein cows housed in freestall barns in Minnesota. J. Dairy Sci. 89:3052-3058. Janni, K.A., M.I. Endres, J.K. Reneau, and W.W. Schoper. 2007. Compost dairy barn layout and management recommendations. Appl. Eng. Agric. 23:97-102. Weary, D. M., and I. Taszkun. 2000. Hock lesions and free-stall design. J. Dairy Sci. 83:697-702. 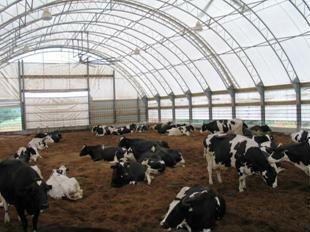 A webcast presentation on compost bedded pack barns was given in January, 2008. The webcast archive includes video segments, power point presentations, and links to additional information.